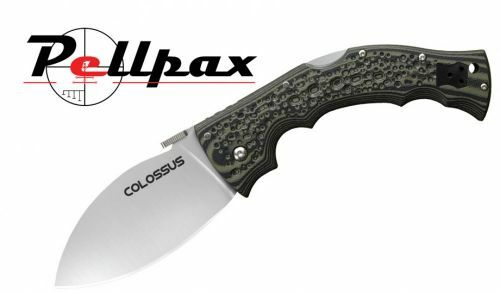 The Colossus is a trust-worthy knife built to last in even the toughest and worst conditions. Able to fold into the handle this knife is a top range knife for the price range. This Colossus' blade comes in XHP Alloy. This is known since it has a larger percent of carbon than other metals. The high percentage of carbon in the XHP Alloy allows it to be more resistant to chemicals and therefore prolongs the life of this blade. Measuring 4" long the blade offers a good reach and a deep, precise penetration. The blade has a Black DLC (Diamond Like Coating) coating which helps protect it from rust and also reduces the friction allowing for and easier cut. The handle offers you the best comfort and control that it can. Made from G-10 and coming with a textured surface the handle provides a good grip to you even in wet conditions to ensure you have total control and the best accuracy possible. Add this item to your basket & spend an extra £223.01 to apply for finance.